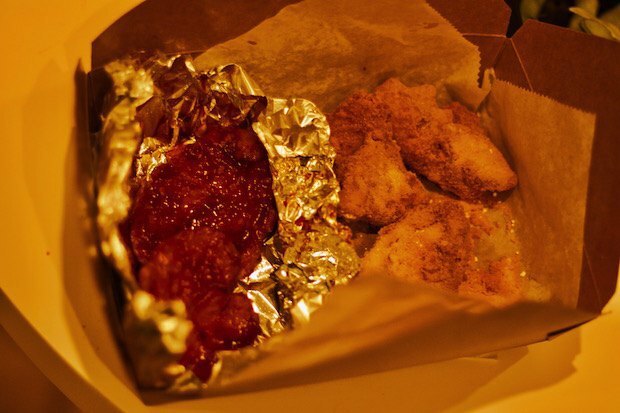 Korean fried chicken that's filling, cheap and tasty right in the middle of Ridgewood. 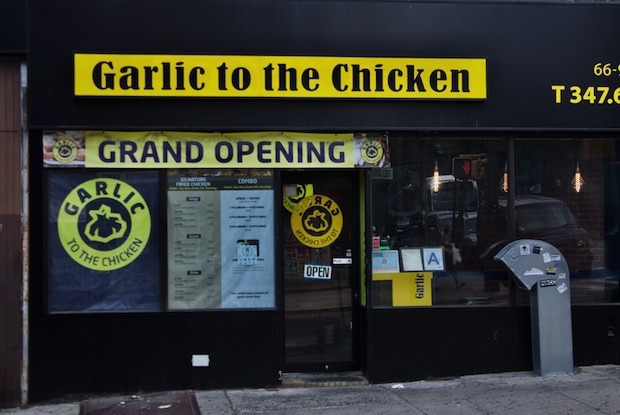 The surprising main event at Ridgewood's recently opened chicken joint Garlic to the Chicken isn’t the garlic: it’s the cheese. One of four options available along with “Soy,” “Spicy” and “Sweet chili” to be paired with the restaurant’s take on Korean fried chicken, it is an old Seoul fast food staple. You can find it at one of the most recent branches of the Korean fast food chain BB.Q, which opened a sit-down location in Manhattan last year, where it comes with a coating of mascarpone. But you can also find it here, where it serves as a testament to rogue, brilliant simplicity. The very slight-looking cheddar powder—fried chicken already looks yellow-ish and gives off a flavor you would discover at the bottom of a Cheetos bag (this is a good thing). It is best enjoyed in chicken strip form, for optimal chicken-to-coating ratio and the experience is something like wandering in a dream into the back of school bus to find yourself still there, where snacks are still some wholesome thing, packed for you every day. Located inside a former take-out Chinese spot, ordering at Garlic to the Chicken can feel a bit like another center of childhood ritual: the dentist’s waiting room where it is always clean, if a little sticky, and where a local news channel blasts car crash updates at every hour of the day. A brick wall and large luminescent lighting suggests the casualness of street food contained indoors, though most chicken fans will feel little reason not to take their order to go. Those venturing out should budget twenty minutes for their order, as food is made fresh with a taste to match. In addition to combinations of the aforementioned wings, thighs and strips, varieties of salads, dumplings and fries can also be ordered. The dumplings, which are only available fried, pair excellently with soy-flavored chicken—both provide crisp explosions of fried salt that rip like paper and will be gone within minutes. Those in search of a healthier option will not go wrong with the edamame salad, which presents the product boiled and accompanied only by the slightest whiff of salt and the restaurant’s signature seasoning. “Our whole menu consists of garlic-based food,” reads a sign. Like the chicken itself, the edamame is elegantly snackable beans boiled just so, popping out of their pods with the ease of roasted nuts, making them surprisingly savory. Which is no reason to skip out on the chicken itself, which is pure, crunchy bliss. 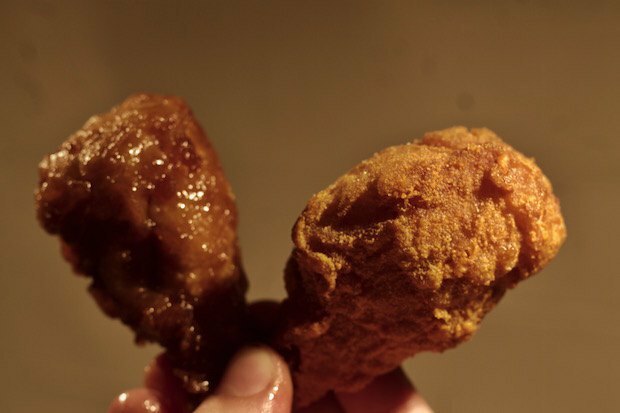 The less health conscious will find much to enjoy in wings that are fried to the point of craters on a bleak moon but are not as greasy, soggy or hard-as-tacks as their all-American cousins. Tearing into them is a delight eagerly awaited and worth savoring. Even the cheddar powder is smartly conservative, leaving fingers mostly clean. Pleasures provided are small but delightful, a snack to share on a rainy day or to nurse a hangover with. A Ridgewood Korean fried chicken joint with tons of sauce options, dumplings and other fun finger foods. Tues-Sat: 7 p.m. - 11 p.m. Sun: 2p.m. - 10 p.m. Follow Garlic to the Chicken on Facebook and Instagram.